Injured in an Accident with a Marcellus Shale Truck? 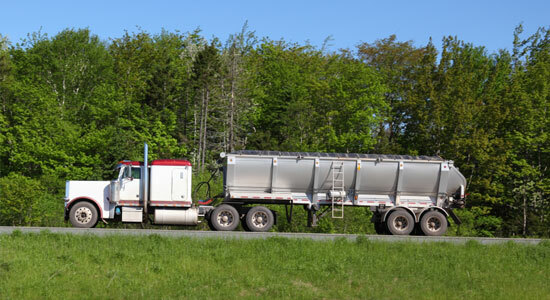 Hundreds of tractor-trailers deliver chemicals to Marcellus Shale worksites every day. More often than not, these trucks are filled beyond capacity and can pose a serious threat to other drivers. Most fracking sites are in rural locations. The roads these trucks regularly use were never designed for heavy industrial traffic. This causes road deterioration and can put you in serious danger as a driver. If you've been injured by an industrial tractor-trailer near a Marcellus Shale fracking site, call our attorneys immediately. We're available at 1-866-943-3427 or simply fill out our free online legal consultation located in the top right corner of the page. Our legal professionals will determine if you have a case for compensation. The road planning for rural areas never took into account the amount of truck traffic that Marcellus Shale fracking companies would bring. Because of this, these roads are not designed with the safety measures required by law. Road Decay – Because rural roads weren't designed for gigantic industrial tractor-trailers, these vehicles can easily destroy the roadway, creating serious hazards. Narrow Roads – Tractor-trailers need a lot of space to maneuver and rural roads weren't planned with this in mind. Reduced Stopping Sight Distance – Due to outdated design, these rural roads don't provide drivers enough time to see a hazard or truck, react to it, and stop to avoid it. Outdated Road Signs – Most roads near fracking sites haven't had road signs updated for the new industrial traffic flow. Dangerous Speed Limits – 55 mph is the speed limit in unmarked rural areas. These limits have not been adjusted for new industrial traffic and can be very dangerous. What is Stopping Sight Distance? Stopping sight distance is the distance between your car and a potentially hazardous object. Roadways are constructed so that you are given ample time to stop once you've recognize a hazardous object. However, with the addition of tractor-trailers on rural roads, this stopping distance isn't the same as with regular passenger vehicles. It takes industrial trucks longer to complete turns and other road maneuvers than cars. This reduces stopping sight distance and can lead to serious accidents. Rounding a bend on a rural road, you see a tractor-trailer turning left into a fracking site. Upon seeing the truck, you make the decision to stop. Your brain sends that message to your foot. Your foot presses the brake. The brakes engage. This whole process takes approximately 1.5 seconds. At 55 mph, you are travelling at 82.5 feet per second. If it takes you 1.5 seconds to react and hit the brakes, you've already travelled 123 feet. Depending on your cars weight, tire tread, road conditions, it can take you anywhere from 100-400 feet to stop – anywhere from 1 to 5 seconds. If the truck's turnoff is only 200 feet from your car, by the time you react and decide to stop (1.5 seconds) you've already covered more than half the distance to the turning tractor-trailer. With another 1 to 5 seconds for the car to stop completely, you've already struck the turning truck. Because these roads aren't designed for large tractor-trailers, many safety guidelines used for planning roads have become outdated. The layout of the roads can be dangerous with fracking trucks, causing serious accidents and injuries. We'll help you plan for future medical care, lost wages and income, and rehabilitation costs. You can put the pieces of your life back together, and we'll help you.